Those who have Geng Metal as their [Original Destiny Source Deity] would have a nature similar to that of the knife, sword and the justice-withholding chevalier. Steely and sharp, the knife and sword are tougher than anything else in nature. As an extension of this symbol, he who has Geng metal as his [original destiny source deity] is sharp, straight-forward, unflinching and indomitable. Whatever he does, he does it with determination and a positive attitude, though he sometimes seems reckless. It is because this type of person believes that it’s much better taking action rather than wasting time worrying. 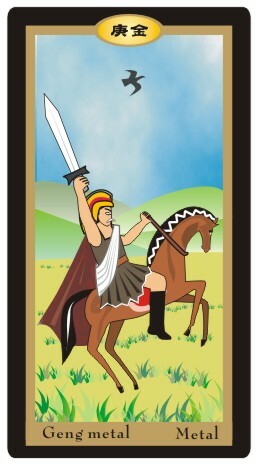 Just as going into battle with a knife or sword, he cannot help charging forward. As a result, Geng Metal values comradeship amongst friends and will defend others against injustice. Generally speaking, he who has Geng Metal as his [original destiny source deity] is gifted with outstanding comprehensive ability. He will put everything at stake in order to learn and train himself. Mostly likely he will be able to master a skill, apply it and be rewarded handsomely. Since this type of person has an intense sense of justice, he will detest injustice and hypocrisy. He’s like a chevalier that can’t bear to see anyone being trampled upon. On the other hand, if he is at the receiving end, he will spare nothing in repaying the favor. He has another trait: eloquence! He ranks third in being pig-headed. If there is ‘PianYin’ which is also overpowering in his destiny case, when depression hits, he would rank second in being suicidal! ‘Face’ is his weakness. Being a die-hard, he will not change his mind once it’s made up. He has a strong desire to express himself. He could be careless or sloppy and often misses the details. He is also prone to lash out, especially when facing someone he doesn’t like. For that reason, he creates enemies easily and is in danger of being used, which he must be wary of. Though the destiny main is Geng Metal with the above mentioned knife & sword tending to ‘dynamic’ features, if your destiny mold is tending to static horoscopes, such as: ‘Zheng Yin、Zheng Guan、Zheng Cai、Shi Shen、Bi Jian、Pian Yin’ etc. Perhaps it will present ‘Dual conflicts personality’!